I love it (sometimes) when the kids decide what type of cake they want. It forces me to get creative. My son has been saying for months that he wanted a bowling party. 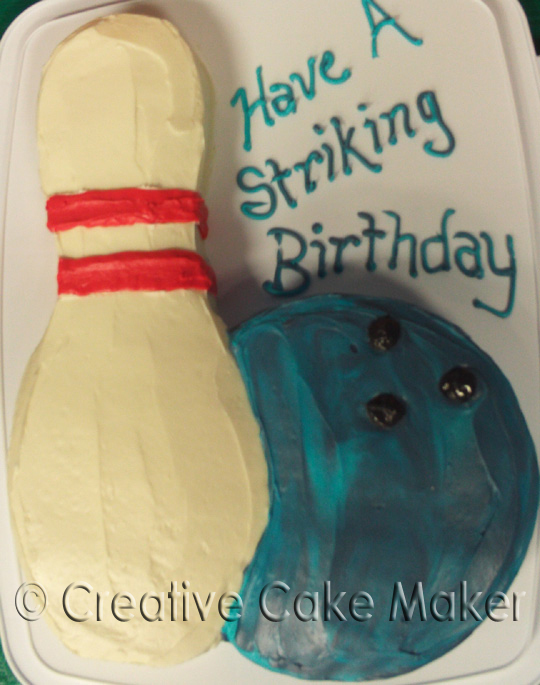 I've known for months that he wanted a bowling cake. I was thinking bowling BALL. He was thinking bowling PIN. I found this out the day before I was to make the cake. I had originally thought about making a dome ball until my son informed me he wanted a bowling PIN. Then I shifted to an oversized bowling pin. I could make a 13x9 cake, cut it lengthwise and set the short ends together. But how would I transport it? I could make a double decker bowling pin cake and carve it into something 3-D. I thought it might look a bit odd. I decided to make a single layer cake. It could then be easily transported in my Wilton Ultimate 3-in-1 Cupcake Caddy (with the cupcake insert removed). From a 13x9 cake, I cut out a bowling pin shape. The kids munched on the rest. I also made two 9" round cakes. One layer went into the freezer for another cake. The other was trimmed to fit next to the bowling pin so I appeared to look like a bowling ball slightly behind the bowling pin. The pin was iced with white canned icing. I reserved a little white from that can to color red for the stripes. I colored 1/2 can of icing purple and the other 1/2 can blue. I put both colors into a decorating bag and covered the cake. Then I gently smoothed the icing over the cake to create a slightly marbled effect. The leftover marbled icing was used to do the writing. If anyone can think of some better bowling birthday verses, let me know. My teenager decided he wanted to do the Extreme bowling party in March (when the bowling alley turns out the lights and the laser lights come on). Hey, this is a great idea! Just wanted you to know I am using your ideas to make a cake for my son's bowling party tomorrow. He'll be 5. I especially like the marbelized icing!